Photo by Aurea Christine Tanaka. “Sustainable development has emerged as a policy focus in many countries of the world, but the fundamental question is — how do you measure sustainability?” asks Zhou Peng, a 32-year-old scientist from China’s Nanjing University of Aeronautics and Astronautics and one of five winners of the ProSPER.Net-Scopus Young Scientist Award in Sustainable Development this year. Given annually to young scientists or researchers based in the Asia-Pacific region who have made significant contributions in the area of sustainable development, the prize provides a platform for sharing innovative ideas and encouraging young researchers. The award is given jointly by ProSPER.Net, a network of higher education institutions in the Asia-Pacific region committed to integrating sustainable development into post-graduate programmes, and Elsevier, a leading publisher of scientific journals and the institution responsible for Scopus, the largest database of peer-reviewed literature. ProSPER.Net is an initiative of the Education for Sustainable Development (ESD) Programme of United Nations University Institute of Advanced Studies (IAS). For 2010, awards were given in four areas: Energy; Water; Agriculture and Food Security; and Economics, Business and Management. Award finalists presented their research at a symposium held earlier this month at Tongji University in Shanghai, China. Winners are chosen on the basis of three criteria — the number of citations of their work, the number and quality of their publications and patents, and the documented social impact from their work. Winners are offered a fellowship from the International Bureau of the German Ministry of Education. The fellowships provide travel and living expenses to spend up to a year collaborating with any research group of the recipient’s choosing in Germany. Peng won the Young Scientist Award this year in the category of economics, business and management. Appointed to a full professorship at the age of 30, he has been working for several years on the issue of benchmarking energy and environmental performance for a low-carbon future. Results from two of his research projects have been used by the Ministry of Trade and Industry, and the Ministry of Environment and Water Resources of Singapore. “In order to manage something, we need to first measure it. Zhou Peng’s work looks at measuring environmental performance, which is very important in the context of business and management,” says Richard Welford, a professor at the University of Hong Kong and one of the panelists involved in selecting the finalists and winners of the award this year. Chin Ping Tan from the Department of Food Technology of the Universiti Putra Malaysia received an award in the category of agriculture and food security for his work on the sustainability of palm oil and lipid products. Oil palm is considered Malaysia’s golden crop; the country is the second largest producer of oil palm with 41 per cent of global production and 47 per cent of world exports. Two types of oil are produced from the palm — palm oil and palm kernel oil. About 4.2 million hectares, which constitutes 10 per cent of Malaysia’s landmass, is taken up by oil palm plantations. These give 12 million tons of palm oil every year, which means revenues of 46 billion Malaysian Ringgit (US$ 14 billion). Palm oil is one of the seventeen major oils traded in the global edible oils and fats market and is one of the most commonly used for frying at the industrial level. According to Tan, palm oil has two major fractions: palm olein and palm stearin. Palm olein is used for cooking and frying purposes since it is very stable at high temperatures, while palm stearin is widely used as hardstock fat and in the cosmetic industry. However, oils and fats are considered one of the major drivers of in today’s global obesity epidemic, along with sedentary lifestyles, unbalanced diets and others. The need, therefore, for healthy oils is clear. Tan’s research, focusing on the production of healthy lipids, has resulted in patents related to the production of palm-based salad oil, frying oil, shortening and baking fat. Among other patents that have resulted from his work, the palm-based phospholipids can be used as important emulsifiers in various food and non-food products. Zhengqiang Jiang, from the China Agricultural University, is another winner of the award in the category of Agriculture and Food Security. Zhengqiang’s work on enzymes, particularly xylanases, has already had industrial implications in food preservation. His research has helped improve the quality of bakery products as well as preserved foods such as noodles. He has published 36 papers in English journals and 79 in Chinese journals; his work has been cited over 600 times in Chinese journals and about 250 times in English journals. Award winner S. Venkata Mohan is a bioengineer at the Indian Institute of Chemical Technology in Hyderabad, India. His work on using waste and wastewater to generate clean bio-fuels won him the Young Scientist Award in the Energy category. “Bio-gas or methane, also produced from waste, is not environmentally friendly. However, bio-hydrogen is a clean source of energy and can be used in fuel in cars or fuel cells,” he says. Venkata Mohan has been working on the production of bio-energy since 2003.He believes that his work adds value to an already existing process; wastewater has to be treated before disposal in any case, and the cost of treatment technologies is therefore not an issue. Other areas that Mohan works on are the production of bio-plastics and bio-electricity, both from wastewater. He is currently working on a project for the Indian Government, which looks at the feasibility of producing bio-hydrogen at 10,000 litre levels. 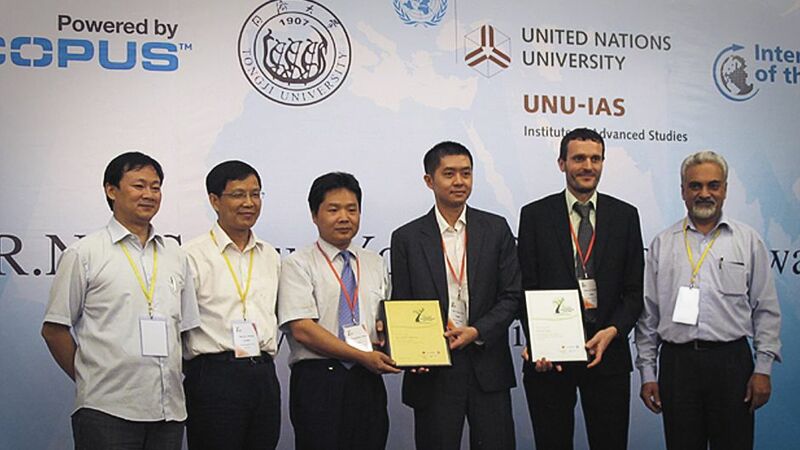 Bingcai Pan, from the School of Environment, Nanjing University, China, won the award in the Water category. In large developing countries like India and China, organic pollutants have been traditionally treated by processes such as biodegradation or oxidation, or by incineration. However, these processes are not always sustainable due to the high cost involved and because they do not deal with inorganic pollutants such as toxic heavy metals. Pan has been working on ways to achieve the deep removal of heavy metals, for instance the removal of arsenic from water and wastewater. His work has resulted in several patents concerning environmental functional materials and their implementation in water and wastewater treatment. The Chinese government has also referred to his research in detailing stringent regulations in the treatment of heavy metals. Wastewater that has been treated with the process that Pan has developed can be reused as washing water for raw 2-3 acid products, a process required for manufacturing many high-purity chemicals. His research on polymeric nanocomposite adsorbents has been used to remove metal and inorganic pollutants present in groundwater that is later suitable for drinking purposes, washing clothes, dishes and so on. All winners of the Young Scientist have this in common: they have not only developed innovative technology but have been successful in transferring these from the laboratory to the ground where they make a positive difference to peoples’ lives. Their work moves beyond lab work to real technological development and to promotion and marketing. Their contribution to sustainable development is in adapting technologies to local contexts, at the village level and at the government policy and industry level. For more information on the ProSPER.Net-Scopus Young Scientist Award in Sustainable Development, click here. Awarding young scientists’ work in sustainable development by Sampreethi Aipanjiguly is licensed under a Creative Commons Attribution-NoDerivs 3.0 Unported License. Sampreethi Aipanjiguly is the former Communications Coordinator for the Education for Sustainable Development Programme at UNU-IAS. She has a background in communications and environment conservation and has previously worked on related issues in India, the U.S., Ghana, the Mediterranean region and the Eastern Himalayan region (Nepal, Bhutan, northeast India).